Experience Hendrix, L.L.C. 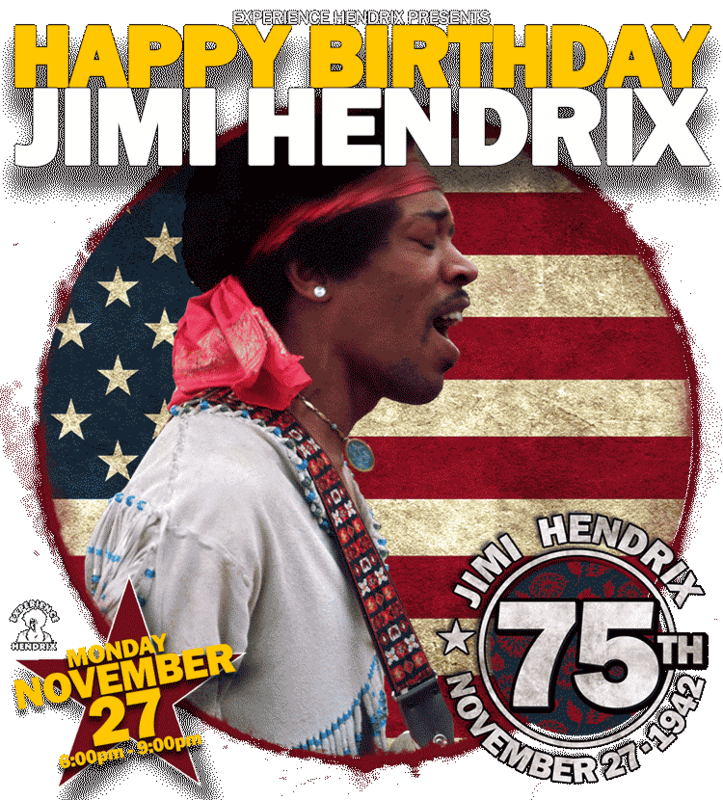 and the family of Jimi Hendrix are pleased to announce a special one-night-only (Monday, November 27, 2017: 6:00pm-9:00pm) event to celebrate the 75th Birthday of legendary rock icon, Jimi Hendrix. 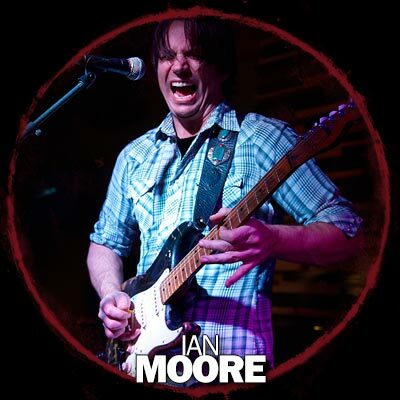 Hosted in the Cavern Club at the Hard Rock Cafe Seattle, this intimate special event will feature live performances by The Electric Landladies featuring Ian Moore, Andy Stoller and Michael Musburger. 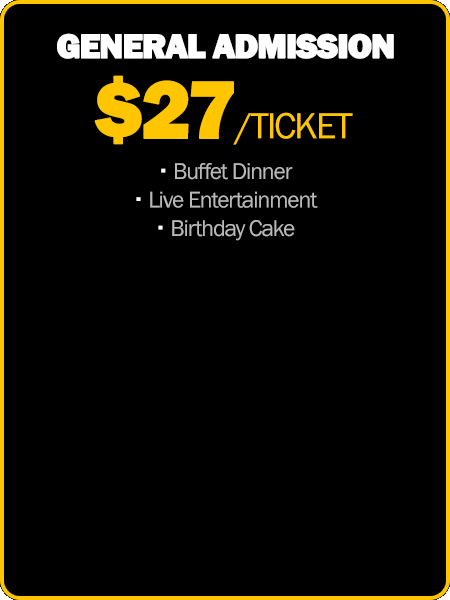 Your event ticket includes a dinner buffet, live entertainment and a celebratory helping of Jimi Hendrix’s birthday cake. 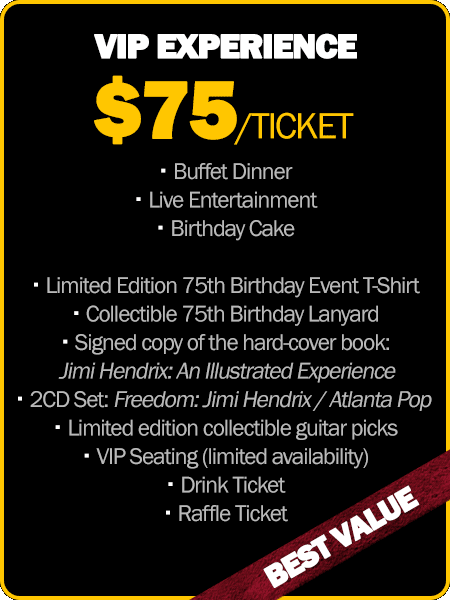 Upgrade your party access with our VIP Experience and receive an exclusive swag bag featuring a limited edition 75th Birthday t-shirt; a signed copy of Jimi Hendrix: An Illustrated Experience hard cover book; an exclusive, limited edition collectible VIP lanyard; a copy of the 2CD set Freedom: The Jimi Hendrix Experience Live At The Atlanta Pop Festival; limited edition guitar picks; access to seating (limited availability); raffle ticket, a drink ticket and more. 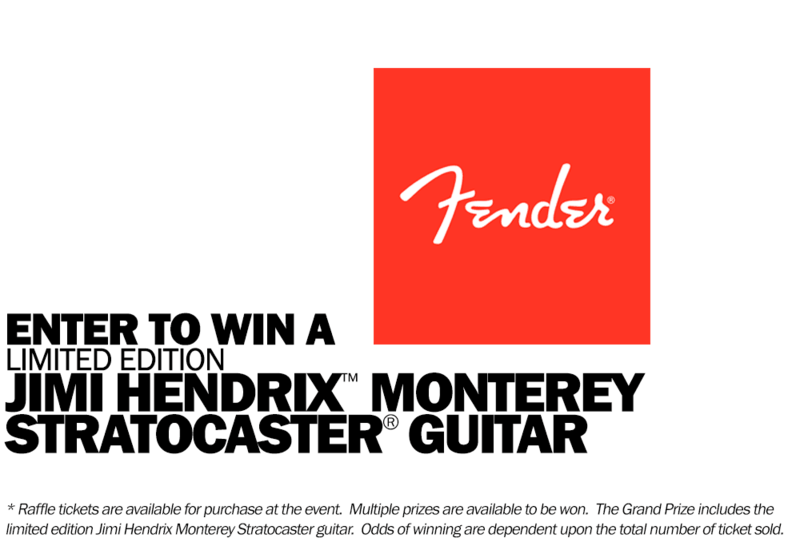 All event proceeds will help fund ongoing construction efforts at Jimi Hendrix Park. Throughout the latter half of 1965, and into the first part of 1966, Jimmy played the rounds of smaller venues throughout Greenwich Village, catching up with Animals’ bassist Chas Chandler during a July performance at Caf‚ Wha? Chandler was impressed with Jimmy’s performance and returned again in September 1966 to sign Hendrix to an agreement that would have him move to London to form a new band. 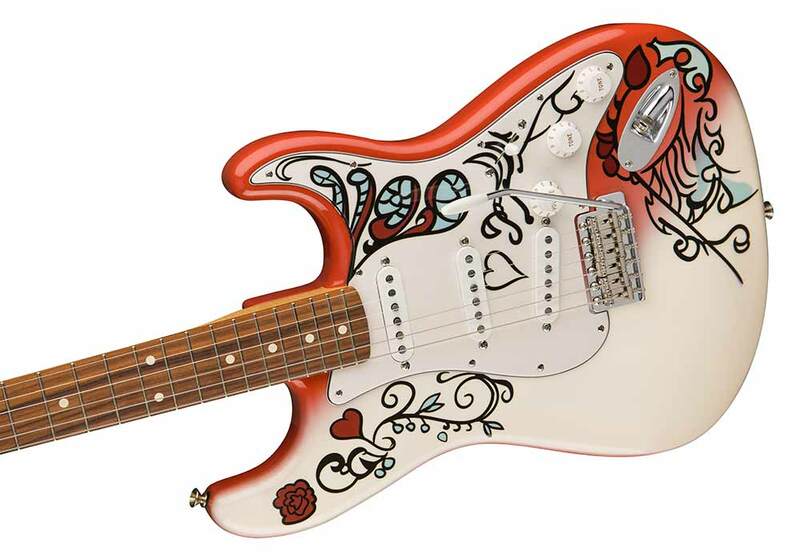 Create a community space inspired by the electrifying music and story of Jimi Hendrix. To create a gathering place for individuals of diverse backgrounds and ages to celebrate cultural heritage, experience community pride, and enjoy innovative educational programming. In 2006, the Seattle Parks and Recreation Department renamed the nearly 2.5-acre neighborhood park located in Seattle’s Central District, Jimi Hendrix Park, with the goal of turning it into a community gathering space honoring this Seattle-born artist’s extraordinary life and musical legacy. The Park lies adjacent to the old Colman School, which since 2008 has housed Seattle’s Northwest African American Museum. Now, a dedicated group of Seattle residents has come together to turn the dream of a park inspired by a “West Coast Seattle Boy” (the artist’s own description) into reality. Named the Friends of Jimi Hendrix Park (FOJHP), the group has met for over a year, laying the groundwork for the development of a space that will draw visitors from across the globe. In keeping with the spirit of unity underlying the project as a whole, the Friends are committed to seeking community input into every aspect of the Park, from fundraising to design to programming. 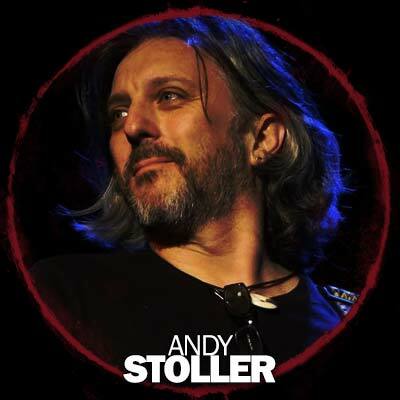 At the core of this project is the belief – embodied best by Jimi Hendrix himself – that with talent, determination and passion, anything is possible. 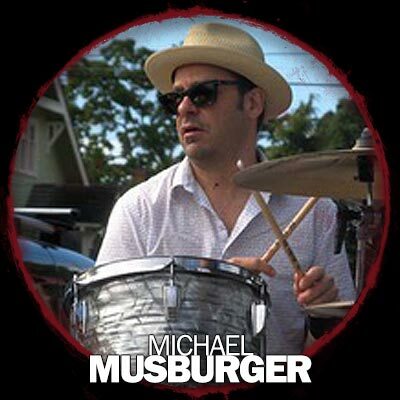 All proceeds from ticket sales will be donated to the Jimi Hendrix Park Foundation, a federally registered 501(c)(3) non-profit organization and the money will be used towards the ongoing construction efforts on Phase 2 of the Park. Jimi Hendrix Park is located in Seattle’s vibrant Central District adjacent to the Northwest African American Museum and on the south-side of the I-90 lid. Hours: 4:00 a.m. – 11:30 p.m.